With its circumferential tread pattern, the IC35 offers a high level of safety with its excellent grip and stability. Moreover, it features excellent steering characteristics thanks to the flat solid-tread pattern. The IC35 is available in size 3.00-4. 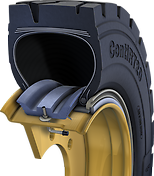 The Continental IC36 offers a high level of safety with its excellent grip and stability. It features excellent steering characteristics thanks to the flat solid-tread pattern. The IC36 is available in the size 15x4-8. For demanding applications in hard conditions.